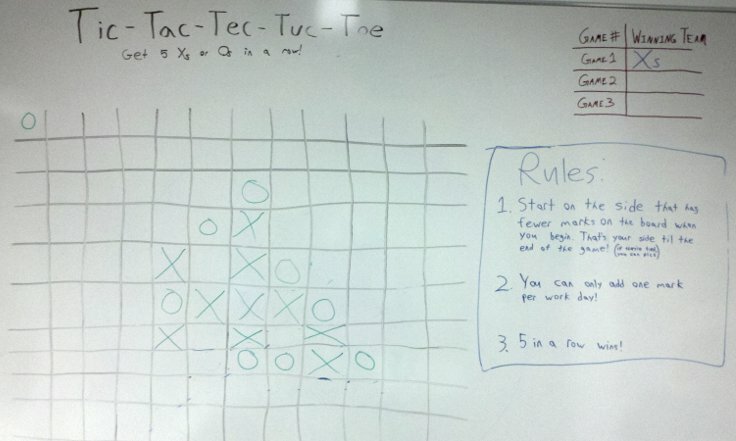 Tic-Tac-Tec-Tuc-Toe is an office whiteboard game. It’s sort of like asynchronous, multiplayer tic-tac-toe. Join the side that has fewer marks on the board (if they’re tied, you can pick). You may add one mark per day. The team that gets 5 in a row first wins the game. There’s no limit to the number of players; this is really a social game about recruiting and coordinating your team. Also, bosses should love it since it incentivizes staying late (for last mover advantage) and working weekends (for extra moves)!